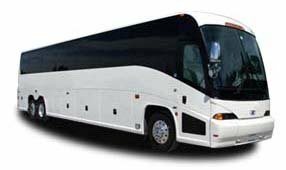 New York Charter Bus Company specializes in pairing each travel group with the best motorcoach rental to fit their needs and itinerary. We have access to top-of-the-line charter buses and minibuses of various sizes and models, so finding the right ride for your travels is simple and easy. Need help deciding? Our representatives are available 24/7 to answer your transportation-related questions and help you assemble your perfect fleet. Call 917-388-9602 today for a free, no obligation quote! Keep everyone together on your next trip with a 25-passenger minibus. This model is perfect for small- to medium-sized groups who need efficient, short-distance transportation. Its compact size allows easy travel across busy streets, while its roomy interior provides plenty of elbow room for everyone on board. Book a 20-passenger minibus to streamline your small or medium group’s travels in New York City. Its modern design guarantees each passenger’s comfort and safety in their travels, especially with amenities like air-conditioning and storage compartments. Planning a long-distance trip or travel for a large group? This 56-passenger model is the best fit for you. With amenities like WiFi, power outlets, plenty of legroom, panoramic windows, and much more, your passengers will stay entertained, relaxed, and comfortable on the road. The smallest of our minibus options, this 18-passenger model is ideal for transporting small groups over short distances. Your professional driver can easily traverse city traffic in this top-of-the-line minibus and ensure your group reaches its destination on-time and ready to go.